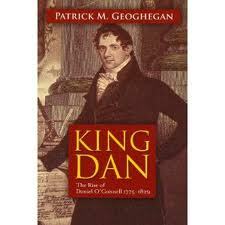 King Dan, The Rise of Daniel O’Connell 1775-1829, By Patrick M. Geoghegan, Gill & MacMillan, 2008. Daniel O’Connell, Patrick Geoghegan writes in his introduction to this biography, “remains one of the most important and complex figures in Irish history. And yet in recent years he has become unfashionable, sidelined by much lesser men and relegated to a position of relative obscurity”. He has a point here. Daniel O’Connell has a street named after him in almost every Irish town (and normally a statue as well). And yet unlike, say, the leaders of the 1916 Easter Rising, his name is hardly ever invoked as one of the great leaders of the Irish people. What is more, as most of us learn Irish history only from the late 19th century onwards in school, O’Connell’s life and times are less and less familiar to even educated Irish people. Not only is this something of a shame, it is also a fairly serious gap in our knowledge. Because what O’Connell achieved was both remarkable and important. He was one of the first politicians in Europe to mobilise a mass popular movement, dedicated to peaceful agitation for political reform – in this case full civil rights for Catholics. What O’Connell achieved was both remarkable and important. He also went a long way towards shaping modern Irish nationalism by galvanising the Irish Catholic community behind self government. Historian Tom Bartlett has written that in the mid 18th century, the “Irish nation” was understood to mean the Protestant, “political nation”, by the mid 19th, it was understood to mean the resurgent Catholic community. O’Connell, as Geoghegan’s biography narrates, had a lot to do with this, by insisting at all times that Catholics in Ireland were to be “slaves no more”. The by-product of this of course, was that Protestant “patriots” could no longer count on leading mass movements in Ireland as they had in the 1790s. Protestant “ultras” who opposed all concessions to “papists” were still more alarmed. However what is really fascinating about this book is that Daniel O’Connell was not only a kind of Irish political chieftain but also very much a European intellectual and that the development of his ideas were in large part a parallel of wider European thought. The young Daniel was born in an environment not completely severed from the Gaelic past. His family, Catholic gentry from Kerry’s Iveragh peninsula, were native Irish speakers. Not only that, but they still followed the practice of fostering their children to engender alliances in the local area. As an infant, O’Connell was brought up by his father’s herdsman in the Kerry mountains. His eldest son, in turn, we learn, had Irish as his first language, where his mother wrote, not altogether approvingly, “he talks a lot but all in Irish”. O’Connell, though, who was fluent in French as well as English, never seems to have seen his first language, or the Gaelic traditional culture of much of his native Kerry as political markers. In this, he echoed both wider European trends and also his own family. The O’Connells were far from downtrodden natives or isolated representatives of a lost civilisation. Daniel’s uncle Maurice “Hunting Cap” O’Connell, “amassed a large fortune through various legal and illegal ways”. It was he who funded Daniel’s studies in Paris (and later London and Dublin) – a path well-trodden by the better-off Irish Catholics at the time. The O’Connells don’t seem to have worried too much about things like cultural identity – they worried about utilitarian things like getting ahead and getting their children ahead. If English and French were more useful in this respect than Irish, then so be it. Very European indeed. It was not for another two generations or so that people in places like Flanders or the Basque Country or Catalonia began to think that the “low culture” of the “common people”, was worth preserving and might even be the most important mark of a person’s identity. But O’Connell, as Geoghegan’s book makes clear, was a nationalist in two identifiable ways. One, obviously enough, was that from the very start he championed the independence of Ireland from Britain. As a young lawyer in Dublin he came to prominence by opposing the Act of Union of 1801 that abolished the Irish Parliament. 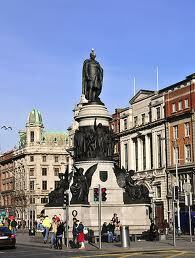 Throughout his career the return of Irish legislative independence was something he demanded. But that was not all. Let’s define nationalism as the belief that the natural political unit is a community of people, united across class and other boundaries by shared characteristics and territory. O’Connell’s belief (and he never seems to have doubted himself here) was that his mission was to lead the Catholics of Ireland to political power; from a position of “slavery” to “freedom”. He didn’t invent sectarian divisions in Ireland but he did perhaps, define the idea that the Irish nation essentially meant the long-oppressed Catholics – unspokenly considered the natives of the country. Because of this, O’Connell, the lawyer, property-holder and cosmopolitan, found it natural to champion the cause of Whiteboy and Rockite agrarian rebels, brought before the courts on charges of “outrages”, against the largely Protestant landlord class. Indeed Geoghegan’s book opens with O’Connell’s successful defence, at Doneraile, Kerry, of two such rebels. Had it not been for the idea of a “national community” (and also the very real ties of culture community and religion) O’Connell would surely have found himself on the other side of this class war. Instead we find him in court, mocking the upper class English accent of the prosecutor of an agrarian “terrorist”. At other times, indeed, we find O’Connell buying pistol ammunition off redcoats to ward off the bandits that lurked in the Kerry hills. And he had, at the time of the 1798 republican rebellion, served in the Lawyers’ Artillery Corps of the Government’s Yeomanry Militia (though he does not seem to have had a choice in this). But in the end, communal solidarity as well as the very real barriers put in the way of all Catholics, trumped all. A religious man or a secular radical? The really interesting thing about this is that the effective founder of Irish Catholic nationalism was not a practicing Catholic at all for much of his life. The young O’Connell, like so many of his generation and class of Europeans, was a rationalist and Deist. That is, he believed in a Supreme Being – but not in a universe controlled by God or in organised religion. He was caught up, a s young student in Paris, in the mob violence of the Revolution and threatened with lynching as an “aristocrat” –an experience that gave him a horror of political violence – but that didn’t stop his attachment to atheistic “Jacobin”-style politics. Geoghegan reveals that he was secretly signed up as United Irishman in Dublin in the 1790s and administered the organisation’s Oath to other young men – something that very nearly got him arrested. So while he never stopped being a Catholic in an Irish tribal sense, in terms of beliefs, he was really a secular radical in his young days. He seems to have seen Catholic Emancipation and Repeal of the Union in terms of conquest of power by “the people”. If he was opposed to armed revolution, it was not, initially at least, on moral grounds, but because he thought it would not work. He was a great admirer of figures such as Napoleon and Simon Bolivar, both noted for their militarism as well as anti-monarchical politics. But like a great many other radicals of the late 18th century, in time he not only abandoned ideas of revolution, but also re-embraced the religion of his youth. The tipping point appears to have been two duels in 1815, in one of which he killed a man named D’Esterre, with whom he had exchanged angry words in a political debate. The experience seems to have awakened in him a need for a moral schema to understand the world. It wasn’t enough to be rational and useful – actions had also to be moral and right. One consequence of this was that O’Connell forswore dueling, despite several other subsequent challenges. O’Connell’s conversion back into the faith seems also to have been encouraged by his wife and a French Jesuit named L’Estrange, who became his close advisor. In his return to religion, he followed a great many other Europeans in a retreat from secular radicalism in the early 19th century. Perhaps it is too simple to equate O’Connell’s return to the faith with his retreat from radical politics. However, it is the case, as Geoghegan shows, that Catholic Emancipation – that is the right of Catholics to hold Office in he United Kingdom, was achieved only at the cost of slashing the electorate in Ireland. O’Connell accepted, in return for Emancipation, that the electorate in Ireland be reduced sharply from 216,000 to 37,000 men as the property qualification for voting was raised from 40 shillings to £10 per year. The “40 shilling freeholders” who were the bedrock of his support were sacrificed for rights for the Catholic economic elite. Geoghegan’s book stops here, in 1829, before O’Connell’s next project, the campaign for Repeal of the Union began. A second volume, Liberator: The Life and Death of Daniel O’Connell 1830-1847, is due out later this year. This is a weighty work, full of detail, and certain chapters, such as the one on O’Connell’s legal career, may strike some as heavy going. However, where the book really stands out is in its recreation of a hugely important, but poorly-remembered period in Irish history. See another review of this book here. The second volume, Liberator, is reviewed here. Written by: John_Dorney on 6 September, 2010.on 4 February, 2013. 4 Responses to "Book Review: King Dan The Rise of Daniel O’Connell 1775-1829"
Not an expert on O’Connell here at all! Take it up with Patrick Geoghegan! Thanks re the website though.